I dream about my grandparents a lot. Sometimes I am confused, thinking maybe I fixed them and they are back in my life and just fine and sometimes I know it is a dream. Last night I had a dream that I knew was a dream. 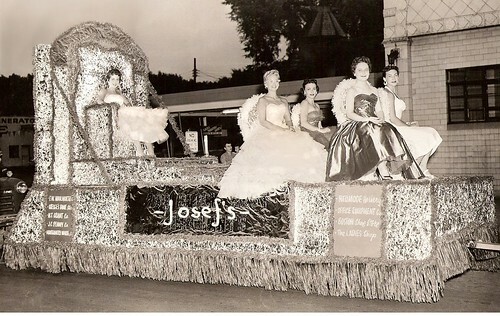 I knew it was a dream because they were sitting on a cloud that looked like a parade float, and when my grandma spoke to me the words sounded like my words and not like hers. I knew it was me talking to myself. "Hi, it's really me!" she said. "There is a brown coat that I want you to have! I spilled soup on it a few days before I died because I was starting to secretly be sick even though no one knew, and my secret sickness made me spill my soup. It is in the white laundry hamper in the room that used to be yours and it is the one I wore to your talent show in fifth grade and you will recognize it. Go to my house and open the hamper and when you find it there you will know that this conversation was real." And when I told Luke about this dream later I cried a little and he asked me if I kind of wanted to go look in her dirty clothes and I said yes. 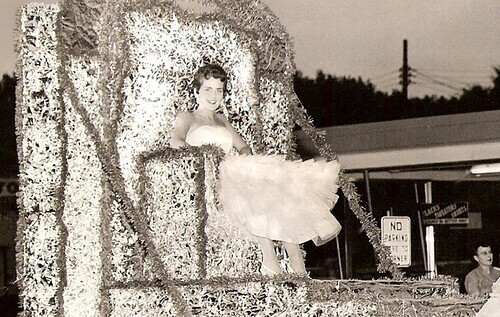 Now here is a photo of my grandma, looking like an angel, sitting on a parade float that looks like a cloud. i can literally feel your sadness from my living room in atlanta. i so wish i could hug you right now. sometimes i feel like we're living a parallel life. the other night, we were out with my uncle and cousin, and she & i started talking about our family, and one thing led to another...next thing i know, we're talking about my grandma, and i'm in tears, at a bar. awesome. i love that picture. i hope you find that coat. i think i love that your husband asked you if you wanted to go and find it. and i really want to hug you. i would totally make the drive to look in her dirty clothes. oh, man. do you all still have to [get to] do all that at her house? i'm so sorry, erin. i'm saying a prayer for you right now & i hope she gives you a big ol' hug of a dream tonight. wow, your grandmother was very beautiful. I remember having a dream about my own grandmother a few years ago in which she spoke to me with a sort of message of sorts, but again I didn't know whether it was just my brain playing tricks on me, but sometimes you wake up from a dream and it just feels different. In my dream I was told to give a message to my father that everything was alright..and I hesitated as to whether I should tell him, he might get upset or he might think it silly that I'm telling him about a dream as if it were real. My grandparents all passed away when I was very young, so I really can't remember how they spoke, their mannerisms - it's only in the stories of my family that I have pieced together what they were like but it is oddly comforting to dream of them and imagine as though it is real time spent together. I sympathise with you over this feeling of loss, and I really hope that you find that coat. so sorry for your loss. I believe that sometimes we dream things for a reason, this sounds like one of those dreams. she wants you to have that jacket..you have to find that jacket. Oh that is gorgeous. And I know they come to us in dreams. Some nights I can't wait to dream so that I can be with people I love. You convey Dream Sadness very well. So Erin, do you think the voicemail she left me that same night (while I was sleeping) will be there when I try to listen to it again today? Maybe it will be you talking. I laughed pretty hard when I read this because I share your brain (but only sometimes). Leave me a message, and I will hear Nanny in it. She's in everything we do and say. Dreams allow us to have conversations that we are too busy to have when we are awake and dealing with "real" stuff and life clutter. Sometimes they are just as important as what happened to us in our waking state. Glad you got to see your grandma. I would go check the hamper, too. If not the brown coat, there is probably some reason you need to go visit. Your dream is just so painfully beautiful. Fantastic, in so many ways. Thanks for writing this down and sharing it with us. I want to cry with you. What a beautifully sad dream, but really how sweet that you dream of her. I really believe that dreams are very healing in so many ways. I resolve things in dreams quite often. Definitely go look for the brown coat. Also, you could TOTALLY blow up that picture really big. I'm sure you could do it at Kinko's or somewhere like that. I know I've seen designers do it and it always looks amazing. Oh, beautiful sadness. I'd totally look in her dirty clothes, and I LOVE so much that Luke asked you if you wanted to. Sending hugs. She is beautiful, Erin. So are you. So beautiful, Erin. All of it. The photo, your dream, your memories, your grandmother, you. What a lovely lady--I love that photo. I would have liked to see you in your fifth grade talent show. Lucky grandma for having been there. When my Mother's mother passed away the Josh Groban song "You Raise Me Up" was very popular and every time it came on the radio I thought of her and her strength and one night I had a dream of her and I walking on "stormy" seas, like the words say. It was SO, so vivid. In other words, I know what you mean. Hugs my friend. Every time I think "There is no way I could love Erin more than I do now" you go and do something like this. Since my mom died, my sister and I always talked about a recipe she made. No one else remembered it, and we couldn't find it. When my dad gave me her "stuff," I sorted through her purse, which hadn't been touched really since the day she died. Old kleenexes and everything. And, there, on a piece of paper, was the recipe. I'm pretty sure she put it there, just for me. I hope you get to go to the house sometime soon. Did you find the coat? I sincerely hope you did. My heart. Oh, my heart. My chest aches. Your grandmother was an absolute vision. Your sadness and grief is absolutely palpable. I dream of my grandparents, too. So SO many of my dreams take place in and around their house, the very real backdrop for all that was good and wonderful in my childhood. Just know I'm reaching across the table, squeezing your hand, and I'm crying, too. I'm so sad for you. I hope you find the coat. And if you don't, I hope you can still find peace. i completely understand this. and i think that it's possible for our relatives to come to us in dreams, the place where reality and our hopes and fears and collective unconscious all collide. that picture of your grandmother is so beautiful, and i hope that dreaming of her on the cloud float brought you comfort. my husband would know that i'd want to go check the laundry basket, too. i believe in whimsy and love and both being able to cross the barriers of life and death. i would want to check, too. erin, i'm so sorry. my heart breaks for you, and i wish i could give you a giant hug that i'd hold onto for way too long. you're such a beautiful soul, and i hope that there's something in that basket that brings you comfort. She is very, very beautiful. I am glad you had a love like that in your life. Grandparent love is so special and wonderful. I loved this post and will keep you in my prayers this weekend. I am so sorry for your loss. saying a pray ... your g-ma was gorgeous! find the coat! i know that i don't know you ... but i'm sending you a hug! 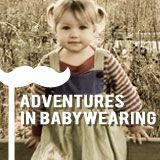 ... i'm a new follower & love your blog. She really is on a cloud. Gorgeous. XO. I'm so sorry you miss her, wish she was still in your life and in your dreams. I would go and look for the coat as well.